Preheat the oven to 375°F. Line muffin tins with paper cupcake liners and set aside. Prepare the cake mix batter according to the package directions and spoon the batter into the prepared muffin tins, filling the cupcake liners 2/3 full with batter. Bake the cupcakes for 11-12 minutes, or until the tops are cracked and dry to the touch. Let them cool completely. 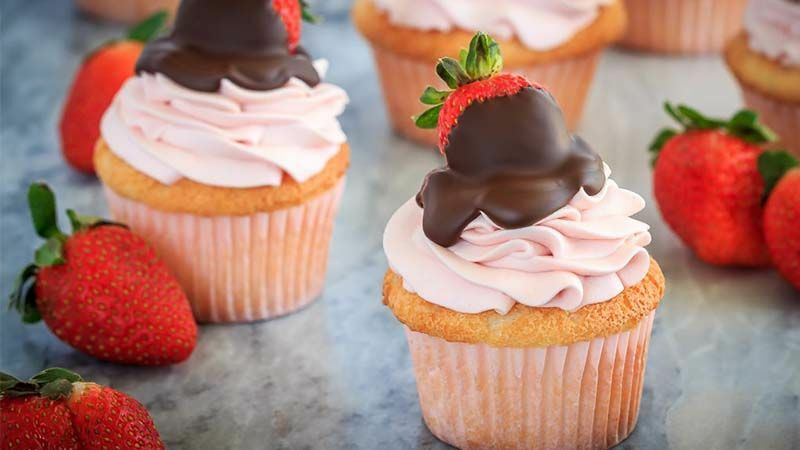 You may have some leftover strawberry whipped cream, depending on how big a swirl you put on each cupcake - it keeps well in a sealed container in the refrigerator for 3-4 days.